A Pakistani policeman has been arrested after allegedly killing a man with an axe because he suspected him of committing blasphemy. Police say Faraz Naveed struck the victim, Tufail Naqvi, on the neck and head after the latter was arrested during a street fight on Wednesday. The victim is reported to have had a history of mental instability. His death comes after a Christian couple were killed by a mob on Tuesday for allegedly desecrating the Koran. Blasphemy is a highly sensitive issue in Pakistan and critics argue that blasphemy laws are often misused to settle personal scores and unfairly target minorities. Mohammad Amir, head of Gujrat city's Civil Lines police station, told BBC Urdu that Mr Naveed had been arrested for the killing. He added that Mr Naqvi, a Shia Muslim, "was not of a sound mind and would hurl abuses at any one". There was some evidence, Mr Amir said, that he had spent time in a mental asylum. The victim, a resident of Jhang city, was supposedly in Gujrat in Punjab province to gain admittance to a Shia religious school. He reportedly blasphemed against companions of the Prophet Muhammad while in the police station. As Mr Naqvi was killed in police custody, a special board will perform the post mortem. Tuesday's killings also occurred in the Punjab, the country's most populous province. The female victim, a pregnant mother-of-four, was beaten by a mob along with her husband and burned to death in a brick kiln. Her father told the BBC she had really been killed over a wages dispute. In September British citizen Muhammad Asghar, who suffers from mental illness, was shot in prison where he had been detained after he was accused of blasphemy. Mr Asghar, who wrote letters claiming to be a prophet, survived the attack. Correspondents say the mere accusation of blasphemy is enough to make someone a target for hardliners, as is defending those accused of blasphemy or calling for the laws to be reformed. In 2011, former Punjab governor Salman Taseer was shot by his bodyguard Mumtaz Qadri after he voiced opposition to the blasphemy laws. Mr Qadri, who is in the same prison as Mr Asghar, is on death row but a date for his execution has not yet been set. Critics of the laws say they are often used to settle personal grievances. Muslims constitute a majority of those prosecuted, followed by minority Ahmadis. 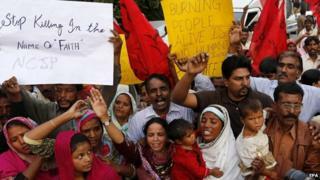 What are Pakistan's blasphemy laws?